Tonight after setting up with friends and being thwarted by clouds, I raced home to see if I could still observe part of the lunar eclipse from a different location. Upon arriving home I found it was clear and quickly set up my 15×70 binoculars. I was delighted to see h Virginis just peeking its bright head out from behind the limb of the Moon and quickly started a sketch of my observation. The umbra had almost made it over the last portion of the limb and the remaining edge was brightly lit. The Moon took on a coppery glow and the stars shone nearby that normally cant be observed during full Moon. 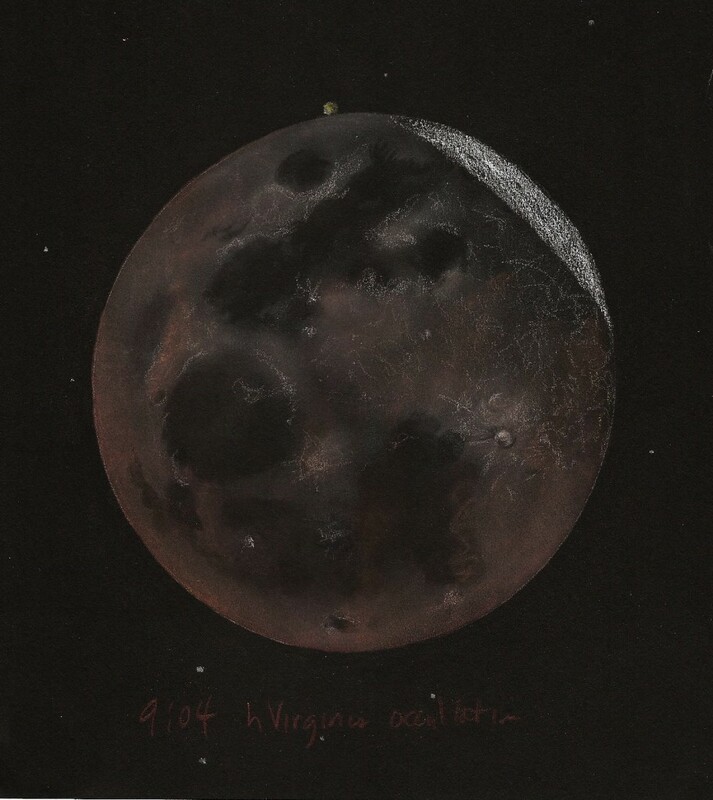 Cindy…Fantastic drawing of the lunar eclipse! Gives a strong feeling of wonder at such events. After nearly a full year of clear nights for the full moon, as luck would have it, we were completely overcast for the event. Superb Cindy, a lovely souvenir, thank you to share this masterpiece with us ! A wonderful capture of the Lunar eclipse. You captured the beautiful deep coppery glow. I love it.